This past weekend, while much of the country was enveloped by cold, rain or snow, I had the pleasure of experiencing California’s beautiful, sunny coastline. A night of camping near San Clemente included a three mile round trip hike to Trestles Beach followed by copious amounts of beer, s’mores and hot buttered rums. But after so many sweets and so much physical exertion, I was ready to partake in the savory, restorative goodness of a bloody mary. For such a feat, I enlisted The Fisherman’s Restaurant and Bar. Situated at the base of San Clemente Pier, Fisherman’s offers a restaurant and separate bar space, each with prime views of waves, surfers and pier going folk. If you decide to sit outside, which you should, be prepared for fresh ocean air, wonderful people watching and, for better or worse, waves crashing directly beneath your seat. I’m not the biggest fan of open water, but the cocktails help allay my fears. So on to the bloodys. The Fisherman’s Bloody Mary features their “own special Mary mix and vodka” for a solid $6.50. Arriving in a salt rimmed, pint sized glass, it included large wedges of lemon and lime, two standard bar olives and a fresh celery stalk. The mix was sweet with just a bit of spice, something quickly remedied by the bottle of Tabasco left at our table. A squeeze of the lemon and lime livened up the drink and the fresh pepper bits provided a nice touch. At the very affordable price of $6.50 a pint, I promptly ordered two and took my sweet time taking in the SoCal beach experience. 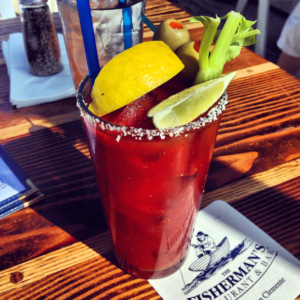 For its bargain bloody mary on the beach, Fisherman’s Restaurant earns 3 Celery Stalks.